Whoa... psychedelic drops.... I'm not getting bored with peacock feathers yet. The work contained in my gallery is copyrighted ©2007-2008 Sherstin Schwartz. All rights reserved. My work may not be reproduced, copied, edited, published, transmitted or uploaded in any way without my written permission. My work does not belong to the public domain and is NOT stock. Hi, this work is amazing. i was wondering if you would allow me to make a quilt out of this. PEACOCK AND WATER,you mixed my 2 favourite thigies! 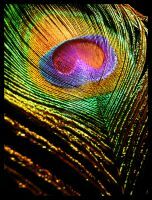 I don't think I could ever become bored with peacock feathers either. 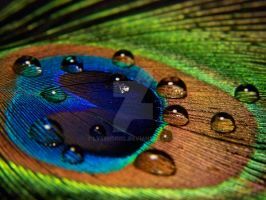 Love the way the water droplet has magnified the feather. WOW !!!!!! IS IS FRICKEN AMAZING !!!! I tired doing that but it didnt work can u give me some tips so they turn out as awesome as that ??? OMG ! The quality is amazing ! I love this photo, so colorful !! Wonderful colors and beautiful composition in this exceptional close-up. I like the iridescent droplets, they indeed have something psychedelic . This is a great macro! nice shot. i love the texture in this one. Congrats for the 3rd place! featured in my journal! Cool! Thank you so much!